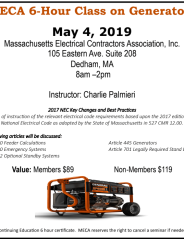 To take advantage of the above discounts please contact the office at 781-320-9811. Identify what Hot Work activities are. 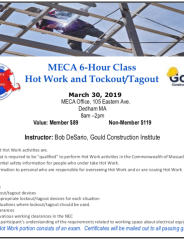 Describe what is required to be “qualified” to perform Hot Work activities in the Commonwealth of Massachusetts. Provide essential safety information for people who under take Hot Work. Provide information to personal who are responsible for overseeing Hot Work and or are issuing Hot Work permits. Recognize situations where lockout/tagout should be used. Improve the participant’s understanding of the requirements related to working space about electrical equipment. This class consists of an exam. You will have the results within 10 days. Certificates will be mailed out to all passing grades. 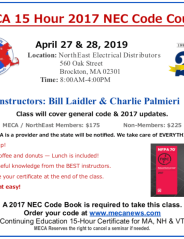 This class includes 6 Hours of instruction of the relevant electrical code requirements based upon the 2017 edition of the National Electrical Code as adopted by the State of Massachusetts in 527 CMR 12.00. 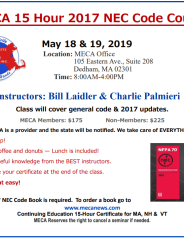 You can save by taking your 15 hour code class and a 6 hour class with MECA. then click on the second class and add that to your cart. Go to your cart and enter code BUNDLE to receive $30 off the total cost of your classes.